Begin with a Baja Breeze card base measuring 5 1/2" x 8 1/2" and emboss the front of the card with the Stripes EF. To "dirty" up the wall slightly, lightly sponge Soft Suede ink across the embossing. Cut a piece of Whisper White cardstock measuring 1 1/2" x 4 1/4". Sponge entired piece with Soft Suede ink then add horizontal board lines with a Chocolate Chip marker. Adhere to the bottom edge of the Baja Breeze cardstock. Cut the side pieces off the framelit as seen above in the Apothecary framelits set. Sponge the edges with Basic Gray ink, stamp the circle image from the French Foilage set onto the "vase", cover with Versamark ink and clear embossing powder and heat set. Add pearls to wear the handles of the vase would be. Glue onto the "table top" and add a shadow below with a sponge and Basic Gray ink. Stamp one of the tea cups from the Tea Shoppe set onto Whisper White cardstock using Pool Party ink. 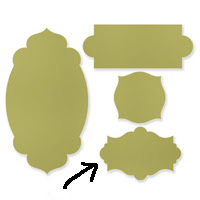 Cut out with paper snips and adhere to the table top; add a Basic Gray shadow below the tea cup. Stamp the bouquet image from the Best of Flowers set onto Whisper White cardstock with Black Staz On ink. Using the marker layering technique color in the bouquet. Carefully cut out with paper snips and glue down below the mouth of the vase. 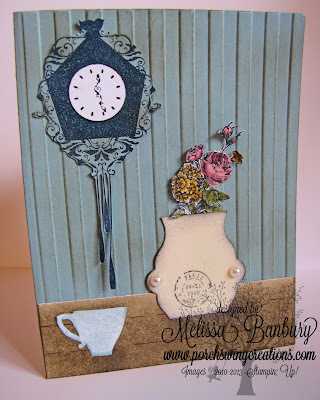 Stamp the clock from the Forever Young set onto Baja Breeze cardstock using Midnight Muse ink. Cut out carefully with paper snips. Stamp the image again onto Whisper White cardstock in Basic Black ink. Cut out the clock face and adhere to the image stamped on Baja Breeze. Adhere clock to the "wall". So, what do you think? Can you smell the fresh bread?? Have a wonderful weekend! Next week I will be posting a video and launching my online virtual club so be sure to check back or sign up to follow my blog and you'll be notified of updates by email! You can also find me on Bloglovin' if you prefer to receive updates that way!